If you’re really into playing PUBG Mobile, Fortnite Mobile, Rules of Survival or other FPS games, it is quite hard to dominate the game without using the right tools. If you ever wonder some players are a very pro at the game. You might be thinking they’re using some kind of cheating program. But in fact, they’re using a mobile trigger accessories to easily fire and scope in the game. Using this tool will allow them to use the four fingers to get extra controls in the game. A Singaporean based start-up company themobilegrip.com, who was also the original creator of the MobileGrip, created a new accessory called MobileTrigger that is dedicated game accessories for FPS games like the PUBG Mobile. MobileTrigger features an instantaneous response time of 0.01ms, and anti-slip protection and tactile switch resistance. As the ultimate mobile gaming shooter accessory, it is optimized to improved your aim by leaps and bounds simply because it lets you play with 4 fingers instead of being stuck with the two thumbs. The MobileTrigger is a separate accessory that allows you to have an extra physical button for Scoping and Firing in FPS games like the PUBG Mobile. Playing FPS without the accessories is quite tricky, as you only have your two thumbs of your fingers to control everything on the screen. Aiming and shooting a moving target in the game is almost impossible to hit as you only had single thumb finger to do both Aiming and Shooting. With the MobileTrigger, it will be more comfortable as you can now use your extra pointing finger to do the Firing, while your thumb finger can now focus on aiming the moving target. There is two variant color of MobileTrigger; One is the Transparent and the other one is the all-black design. We’ve got chance to try the Transparent variant, and we recommend you to get this color if you got a borderless phone like the iPhoneX. The transparent color let you see the visible parts of the game screen when you’re using the accessory. The MobileTrigger is made out of plastic with a shiny embossed finish all over the accessories. It is a good choice of using the plastic materials as it will avoid future scratches from your phone while the accessories, especially when it is being attached or detached, unlike the other mobile trigger in the market the triggering button is made out of metal that is prone in scratching. It also comes with a conductive tape supporting the trigger and tapping button which triggers the tapping gesture to the phone. The two separate trigger claws are non-interchangeable, meaning you cannot switch places of the left trigger button and right trigger button, but yet you can still adjust its position to your preferences. MobileTrigger can support up to 10mm thickness of the phone. In other words, it is compatible with most mobile phones up to date from iPhone X, Samsung S9+, Razer Phone or even older phones like iPhone 6 or 5. It is also compatible in other FPS game not just in PUBG Mobile if the game comes with a customize layout button controls – you can use this accessory to that kind of game. Here is the complete list of game that fully supports with the game accessories: Rules of Survival, PUBG Mobile, Fortnite Mobile, Freefire, KnifesOut, and Critical Ops. Mobile Triggers has two different types of functionality, the button triggers and on the back, the locking mechanism. The button trigger is like the R1 and L1 button that you can find mostly in the game controller on PlayStation, XBOX and Nintendo Switch. This allows you for more natural control of the game by just pressing, and it has tactile feedback. The trigger claw is adjustable in any position, and you can customize this position from your favorite FPS game to match the trigger button position and the button from within your game. The locking mechanism of the accessories securely locks the trigger claw to the device, giving you less worry of losing the accessory. Overall, MobileTrigger is a great build quality, simple design, and sturdy. It takes some time to get familiar with the game accessories, especially when you’re playing a lot of time with only two fingers. Fit in any type and size of a phone. Great for using a scope with the iron sights and a fire button in the game, where you can move and shoot at the same time. Not to mention, the trigger button is tactile that feels like using a real joypad buttons, worth all the money and it’s the best product of its purpose. The Left Trigger came faulty, but there is a solution to fixed this problem, by just pulling the touchpad button the accessories will works as intended. The lock trigger claw also sometimes move while playing the game in long period of time, so you have to adjust it if its not in correct place. The only disadvantage of using this MobileTrigger is you need to remove the protective cover of your phones in order to use them. It also doesn’t fit together with the MobileGrip. You can buy this accessory straight from the official website of TheMobileGrip.com. You can also use this link to get 10% discount when purchasing the accessory, from the original price of $8.90 down to $8.01 only. If you're really into playing PUBG Mobile, Fortnite Mobile, Rules of Survival or other FPS games, it is quite hard to dominate the game without using the right tools. If you ever wonder some players are a very pro at the game. You might be thinking they're using some kind of cheating program. But in fact, they're using a mobile trigger accessories to easily fire and scope in the game. Using this tool will allow them to use the four fingers to get extra controls in the game. A Singaporean based start-up company themobilegrip.com, who was also the original creator of the MobileGrip, created a new accessory called MobileTrigger that is dedicated game accessories for FPS games like the PUBG Mobile. MobileTrigger features an instantaneous response time of 0.01ms, and anti-slip protection and tactile switch resistance. As the ultimate mobile gaming shooter accessory, it is optimized to improved your aim by leaps and bounds simply because it lets you play with 4 fingers instead of being stuck with the two thumbs. MobileTrigger Ultimate Mobile Gaming Shooter Accessory The MobileTrigger is a separate accessory that allows you to have an extra physical button for Scoping and Firing in FPS games like the PUBG Mobile. Playing FPS without the accessories is quite tricky, as you only have your two thumbs of your fingers to control everything on the screen. Aiming and shooting a moving target in the game is almost impossible to hit as you only had single thumb finger to do both Aiming and Shooting. With the MobileTrigger, it will be more comfortable as you can now use your extra pointing finger to do the Firing, while your thumb finger can now focus on aiming the moving target. Look and Feel There is two variant color of MobileTrigger; One is the Transparent and the other one is the all-black design. We've got chance to try the Transparent variant, and we recommend you to get this color if you got a borderless phone like the iPhoneX. The transparent color let you see the visible parts of the game screen when you're using the accessory. The MobileTrigger is made out of plastic with a shiny embossed finish all over the accessories. It is a good choice of using the plastic materials as it will avoid future scratches from your phone while the accessories, especially when it is being attached or detached, unlike the other mobile trigger in the market the triggering button is made out of metal that is prone in scratching. It also comes with a conductive tape supporting the trigger and tapping button which triggers the tapping gesture to the phone. The two separate trigger claws are non-interchangeable, meaning you cannot switch places of the left trigger button and right trigger button, but yet you can still adjust its position to your preferences. Compatibility MobileTrigger can support up to 10mm thickness of the phone. In other words, it is compatible with most mobile phones up to date from iPhone X, Samsung S9+, Razer Phone or even older phones like iPhone 6 or 5. It is also compatible in other FPS game not just in PUBG Mobile if the game comes with a customize layout button controls - you can use this accessory to that kind of game. 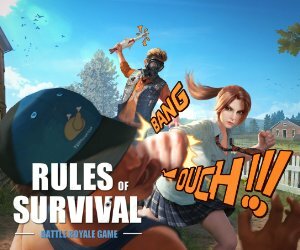 Here is the complete list of game that fully supports with the game accessories: Rules of Survival, PUBG Mobile, Fortnite Mobile, Freefire, KnifesOut, and Critical Ops. Functionality Mobile Triggers has two different types of functionality, the button triggers and on the back, the locking mechanism. The button trigger is like the R1 and L1 button that you can find mostly in the game controller on PlayStation, XBOX and Nintendo Switch. This allows you for more natural control of the game by just pressing, and it has tactile feedback. The trigger claw is adjustable in any position, and you can customize this position from your favorite FPS game to match the trigger button position and the button from within your game. The locking mechanism of the accessories securely locks the trigger claw to the device, giving you less worry of losing the accessory. Conclusion Overall, MobileTrigger is a great build quality, simple design, and sturdy. It takes some time to get familiar with the game accessories, especially when you're playing a lot of time with only two fingers. Fit in any type and size of a phone. Great for using a scope with the iron sights and a fire button in the game, where you can move and shoot at the same time. Not to mention, the trigger button is tactile that feels like using a real joypad buttons, worth all the money and it's the best product of its purpose. The Left Trigger came faulty, but there is a solution to fixed this problem, by just pulling the touchpad button the accessories will works as intended. The lock trigger claw also sometimes move while playing the game in long period of time, so you have to adjust it if its not in correct place. The only disadvantage of using this MobileTrigger is you need to remove the protective cover of your phones in order to use them. It also doesn't fit together with the MobileGrip. Product Details Here are the complete product details of the MobileTrigger Durability: Trigger (Left/Right) - 1 million clicks Length: 43 mm (1.69 inch) Height: 23 mm (0.90 inch) Depth: 10mm (0.39 inch) Weight: 25 grams Colors: Black, Transparent SRP: $8.90 Where to Buy You can buy this accessory straight from the official website of TheMobileGrip.com. You can also use this link to get 10% discount when purchasing the accessory, from the original price of $8.90 down to $8.01 only. Overall, MobileTrigger is a great build quality, simple design, and sturdy. It takes some time to get familiar with the game accessories, especially when you're playing a lot of time with only two fingers. Fit in any type and size of a phone. Great for using a scope with the iron sights and a fire button in the game, where you can move and shoot at the same time. Not to mention, the trigger button is tactile that feels like using a real joypad buttons, worth all the money and it's the best product of its purpose.